Turns out that eating a PB&J is more than just an energy lift, but a mood lift too. It's a thing of beauty. The peanut butter and jelly sandwich is timeless, tasty and even nutritious. But it's something more than that too. PB&J is a comfort food. It's a sandwich so many of us have had for lunch at school or snack after school. It's a fall back sandwich when everything else fails. The players of the NBA are highly tuned into PB&J as both an a quick energy boost and comfort food to improve performance on the court. When you bite into one you're eating healthy fats, a bit of protein and of course, sugar and salt. But it's a magical combination and food format that induces calm and happiness at the same time. A great boost before a game to get into that mental state for winning. What's also interesting about the NBA is players are embracing vegan diets for health and performance. What is a classic PB&J? It's a vegan sandwich. For vegan food options, you've come to the right place. Treatmo is the home of 100s of vegan food options made by locals with health in mind. 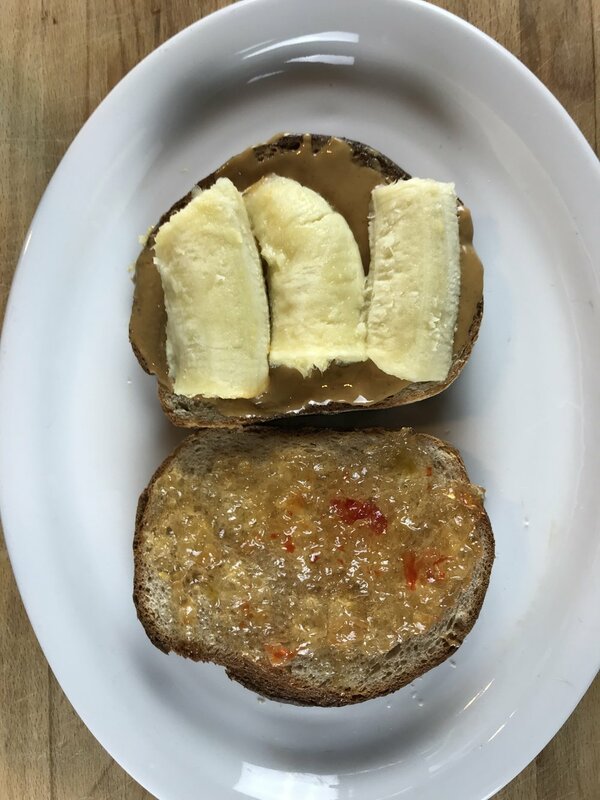 We've dressed ours up with hot pepper jam from Brooklyn Whatever, bananas and clean PB&J -- just peanuts. Our spreads are on local bread and served with CHIRPS cricket chips in BBQ and mineral rich lemonade with Mediterranean Seawater from ZUMO -- all on Treatmo -- the one stop for fresh and natural food in a tap. ZUMO lemonade is one of our favorite new drink discoveries this past year. Available on Treatmo, it is non-GMO, not from concentrate, preservative free and made with Mediterranean Seawater. to cut to the chase, it's extremely refreshing and revitalizing. Grab a pack on the run with Treatmo app! Get the app.